Today I am pleased to announce the launch of my new book entitled “Old Norfolk Post Offices – A Picture Postcard Tour” by Roger A. Davie. 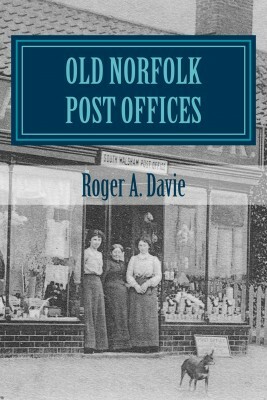 Over the past few years I have been collecting postcards of old Norfolk post offices and also hunting around to see if they still exist. But this was not on foot or by car, this was a virtual tour as I did this using Google Earth – the ambitious and sometimes controversial mapping program we have all no doubt heard of by now. Finding each post office was an interesting pastime and I began to put a lot of this together on my website at www.thestampbook.co.uk where you can see some post offices as they were then and as they are now. Then one day I thought it might be nice to make a little book as a companion together with a bit more information about each one and this is what you see here. Information comes from various sources but a lot of it from reading through copies of Kelly’s Directories of Norfolk covering the early 1900s – so the town descriptions you read here are renditions of information from that time. I quote or paraphrase the introductory information as relayed in the directory. I think this gives a sense of what it was like back then in terms of travel arrangements and so on. It’s certainly eye opening to read about so many railway stations that have now been lost. 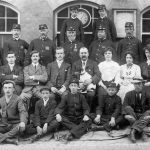 Details of who held the position of sub-postmaster or sub-postmistress in a certain year also come from Kelly’s Directory. If I have been able to find them, there then follows details taken from the various censuses, usually from 1901 or 1911. The postcards I have selected mostly date from the early 1900s and where possible I have tried to enhance them for display. Some were very age worn, but they still give a good impression of the scene. I hope you enjoy this little trip. Over 150 individuals identified. Over 120 postcard images. Old railway connections identified. Extra details taken from census records. Attleborough, Aylsham, Baconsthorpe, Bacton, Banham, Barton Turf, Bawdeswell, Belton, Blofield, Bracon Ash, Brooke, Brundall, Burgh Apton, Catfield, Cawston, Cley-Next-The-Sea, Croxton, Denver, Deopham, East Dereham, East Rudham, East Runton, East Ruston, Emneth, Erpingham, Felthorpe, Frettenham, Fritton, Geldeston, Gillingham, Great Massingham, Great Plumstead, Great Yarmouth; Regent Street, Great Yarmouth; North Denes, Gresham, Gressenhall, Hales, Hanworth, Happisburgh, Hardwick, Heacham, Hempton, Hemsby, Hickling, Hilgay, Hindolveston, Honing, Horning, Hunstanton, Ingham, King’s Lynn, Lakenham, Langham, Litcham, Loddon, Ludham, Lyng, Martham, Morley St. Botolph, Mulbarton, Mundesley, Narborough, Neatishead, Newton Flotman, North Creake, North Elmham, Northrepps, Northwold, Norwich, Overstrand, Poringland, Potter Heigham, Ranworth, Reedham, Reepham, Reymerston, Rollesby, Rougham, Salhouse, Saxlingham Nethergate, Saxthorpe, Scole, Seething, Shotesham All Saints, Snettisham, South Lopham, South Walsham, Stalham, Stiffkey, Sutton, Swaffham, Swanton Abbot, Swanton Morley; Town Street, Swanton Morley; Greengate, Tasburgh, Thetford, Thorpe Abbots, Thorpe St. Andrew, Topcroft, Trimingham, Trowse Newton, Upton, Walcot, Walpole Highway, Watton; High Street, Watton; Post Office Street, Wereham, West Lynn, West Runton, West Somerton, Whissonsett, Winfarthing, Witton Bridge, Woodbastwick, Wood Dalling, Wood Norton, Worstead, Wroxham. Later next week the print edition will be available on the worldwide Amazon stores and other places. Priced at $11.99, £7.99 and €10.99 depending on location for print. Priced at $7.99, £5.60 and €7.32 again depending on location for the Kindle version. Currently the print book is available from CreateSpace. Update : Now available at Amazon.co.uk and Amazon.com in print and for Kindle.